Italian painter. He trained first with Matteo Ponzoni, then with Sebastiano Mazzoni; Mazzoni encouraged the development of a Baroque style, but Celesti was also attracted by the naturalism of the tenebrists. The first known works by Celesti are mature in style, and he had already achieved considerable fame in Venice when the Doge Alvise Contarini honoured him with the title of Cavaliere in 1681. 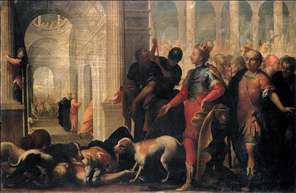 The complexity of his sources is evident in two canvases, Moses Destroying the Golden Calf and Moses Chastising the Hebrew People for their Idolatry, both painted c. 1681 for the Palazzo Ducale, Venice, and signed Cavaliere; they are influenced by Luca Giordano and by the narrative techniques of Jacopo Tintoretto. The most distinguished works of Celesti s early period are two large lunettes that show three scenes: Benedict III Visiting St Zacharias, A Doge Presented with the Body of a Saint, and the Virtues Surrounding a Doge Holding the Model of St Zacharias (c. 1684; Venice, S Zaccaria). These luxuriant compositions represent a remarkable leap in quality from the paintings of the Palazzo Ducale, with lighter colours and a more flickering touch. A little later Celesti left Venice for Brescia, perhaps by way of Rovigo; exactly when he arrived is not known, but he established himself and his studio there for several years. Panfilo Nuvolone and Francesco Paglia (1636-1713) had encouraged the development of a more exuberant Baroque style in Brescia, and in response Celesti created more decorative, lyrical works, such as his ecstatic St Rose of Lima (Brescia, S Clemente) with its brilliant display of glorious light. Most of Celesti s paintings done in and around Brescia were religious canvases, but he also painted portraits, such as the two entitled Condottiero (Ljubljana, Slovenian Academy of Sciences and Arts) and the portrait of Conte Alberto di Baone (Dublin, National Gallery), executed in a dazzling array of colours. In 1688 Celesti was active at Toscolano on Lake Garda, where he painted canvases of scenes from the Life of St Peter (Toscolano Cathedral) and in 1689 decorated the salone of the Palazzo Delay (now Palazzo Mafizzoli) with Old Testament scenes. In 1696 he was at Treviso, where he executed a Last Judgement for the cathedral (untraced) and in 1697, 1698 and 1699 pictures for the abbey of S Floriano at Linz, where his Paradise, for the high altar, remains in situ. By 1700 Celesti was back in Venice, where he set up his studio; Venetian artists of this period, led by Giovanni Coli and Filippo Gherardi, were reviving the style of Veronese, and Celesti, following this trend, produced late works that employed more dazzling effects of colour and light. These works include the frescoed decoration of the Villa Rinaldi Barbini at Casella d Asolo, where Celesti created a series of exotic and theatrical mythological and biblical scenes, distinguished by their luminosity and by their light and airy touch. His last works were three dramatic night scenes: the Birth of the Virgin, the Assumption of the Virgin and the Martyrdom of St Lawrence (1706-11; Verolanuova Cathedral). Celesti was much admired by Charles-Nicholas Cochin and by Jean-Honor Fragonard, and his colour influenced the Rococo art of the early 18th century in Venice and in Austria. 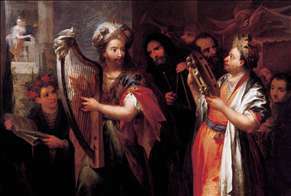 See more details about "King David Playing the Zither"
See more details about "Queen Jezabel Being Punished by Jehu"